Feed your spleen and discover the way to health and happiness. Did you know that your food choices can hurt your spleen? In Traditional Chinese Medicine (TCM) the spleen is responsible for digestion. Your gut is your power core to health and happiness. When your spleen is running like a well-maintained engine, you feel great. When you have failed to do the basic maintenance, you are going to start to have engine trouble and feel unwell. 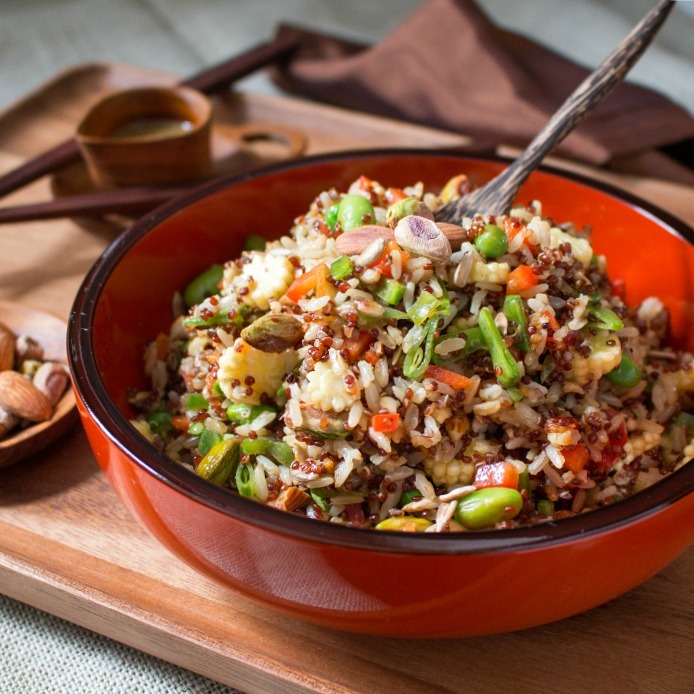 In our article, Introducing the Five Energies of Food by Cindy Mai (Root and Spring) we discussed that there are cold, hot, warm, cool and neutral types of foods. The spleen is weakened by cold and damp foods. The best choices for someone with a Spleen Qi Deficiency would include warming and drying foods. At the end of this article, we are going to share with you diet tips and a Feed Your Spleen meal plan to keep your gut engine running like a well-maintained machine. How Does Your Spleen Work? Your spleen is located under your ribcage and above the stomach in the left upper quadrant of the abdomen. We know you are trying to find that right now on your body but unless your spleen is abnormally enlarged, then you should not be able to palpate it. If your spleen is so LARGE you can palpate it, close your computer and head to the ER. In Western Medicine, the spleen is responsible for many supportive functions in the body. Your spleen works to both filter and store your blood and plays a role in the immune response system. In Eastern Medicine, Traditional Chinese Medicine (TCM), the spleen holds a very important role of governing and transportation, water metabolism, controlling the blood, dominating the muscles and four limbs and opening into the mouth and manifestation on the lips. We will discuss how each of these functions is affected by your diet later in the article. We know it is very difficult to get your arms around TCM, especially if you are already trained in Western Medicine or are new to alternative therapies. We know exactly how you feel. Our writers were trained and worked in the Western Medical field for 25 years before training in TCM. You need to essentially let go of all your preconceived knowledge of Western Medicine and just let this information sink in. We will go slow and high level so you are not overwhelmed. Traditional Chinese Medicine has been around for over 2000 years and has been preventing and treating ailments successfully. We believe that there is importance in both Eastern and Western Medicine and each play an integral part in keeping you healthy. There are many occasions when Western Medicine falls short and that is when Eastern Medicine really shines. TCM plays an important role in prevention of illness and PREVENTION is the KEY! Traditional Chinese Medicine is built on a foundation of more than 2,500 years of medical practices and uses various forms of Chinese herbal medicine, acupuncture, tu nai (massage), qi gong (exercise) and dietary therapy. We are going to hone in on the dietary therapy. TCM is built on the concept that our bodies need to be in balance and extremes in Yin or Yang can cause illness. Yin and Yang are a philosophical conceptualization. It is a means to generalize the two opposite principles which may be observed within the natural world. Yin, for example, represents cold, downward, damp/moist, female, moon and inside. Whereas yang represents, hot, upward, dry, male, sun and outside. 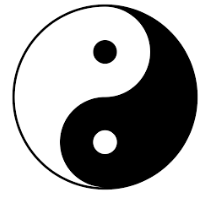 There is an interdependence of both yin and yang. Yin could not exist in isolation without yang and nor can yang exist without yin. An EXCESS of either yin or yang can cause illness. A DEFICIENCY of Yin or Yang can cause illness. An unbalance of yin and yang can occur by eating an abundance of “yin” cooling foods or the Raw Foods Diet. Raw foods are very cooling and the spleen does not like raw foods and nor does it like cold drinks with ice. The reason being is that your body must heat up food to your body temperature for the Spleen to extract the Qi from the food. If your Spleen is already deficient, eating raw food or many cooling foods will take up precious energy that the body can’t afford. By the time the food is heated up, there is even less digestive power and this is when you start to feel unwell. What is qi? Qi is a life energy, or life spirit, a vital force that flows through all living things. The meridians and collateral are pathways which the qi and blood flow. The qi also connects to the zang fu organs (one of them happens to be the spleen) networking our body. If there is a disruption in the flow of qi, we can get sick. The spleen is responsible for transforming food and water and converting it into new qi energy and new blood with the help from the heart and kidney. Traditional Chinese Medicine states that all phenomena in nature can be broken down into five elemental qualities. These five elemental qualities are wood, fire, earth, metal and water. Each of these five elements has a relationship between the zang- fu organs. The spleen is correlated to middle, sweet, yellow, transformation, dampness, late summer, Earth, stomach, mouth, muscle and worry. The GREEN TABLE BELOW explains the “Five Categories of Things According to the Five Elements: Nature and Human Body”. The yellow section of the chart represents the SPLEEN. As you notice, that the spleen correlates to Late Summer. Late Summer is a transitional time and the best time to prepare our bodies for the next season. The late summer time frame is all about centering, grounding and balance and nourishing our bodies, especially the digestive system. (For Example; if you lived in a super snowy regions, it is equal to putting snow tires, making sure your car heater works and putting emergency supplies in your trunk.) You would not skip these prevention measures on your car so why would you be skipping the prevention measures on your health and body? TCM framework treats the person holistically. The mind, body and emotions are all intertwined and there are connections that can either keep the body healthy or cause the body harm. In addition, your surroundings, the time of day, geographical location and the foods you eat can also affect your health. Your body has the potential to keep balance and to heal itself. However, TCM believes that prevention is the best cure and keeping your body in harmony. Did you know that “worrying” can stress out your spleen? How many of you are worry warts? Hands up, if you are a parent, student, teacher, director or have a job – you have worry. We all have stress in our lives but we need to process it differently and not obsess about it. The reason being is when you have worry the spleen decides to essentially stop performing it basic function of digestion. As you can see from the chart above, each organ is responsible for an emotion. The spleen is directly related to our capacity for thinking. Excessive worry will damage the Spleen Qi. Have you ever had Brain Fog or the inability to think clearly? Then you may have spleen qi deficiency. A deficient Spleen can weaken the mind and our capacity to think clearly and focus. We are then more susceptible to worry. It is a vicious cycle and just think with a slight tweak in your diet we can make you feel better and think clearer. TCM uses tongue assessments, pulse assessments, a health physical and emotional health history and thorough visual assessment of the patient to determine the diagnosis and suggestion for treatment. It is rare for any one patient to have textbook classic signs and symptoms, with only one issue. Most often, patients have a combined deficiency or excess. How many times has your general practitioner asked you to see your tongue or throat unless you were complaining of a sore throat or upper respiratory issue? Did you know that your tongue assessment (color, form, coatings and properties) can help determine the cause of health issues? Really! Take a quick look at your tongue now. Is your tongue pink and moist or swollen, pale and with teeth marks around the edges? Is it dry and have deep cracks or dark spots? These characteristics along with other findings leave clues on what is going on inside your body. A classic symptom of spleen qi deficiency with dampness is a pale swollen tongue with teeth marks around the edges. The spleen is responsible for transportation and transformation of water. If your spleen qi is deficient and can’t do its job, then there can be excess fluid and this excess fluid can be manifested as a swollen tongue. The teeth marks are there because the tongue is so swollen that your teeth are resting on the sides of your tongue. As we discussed, the spleen holds a very important role of governing and transportation and transformation of water and food into essential substances. The role of the spleen is important for digestion and absorption of nutrients by your body. The spleen, according to TCM, is the main zang organ manufacturer of blood and qi for the body. When your spleen qi is normal, your digestion and the absorption of nutrients is normal. If you have spleen qi deficiency, you may have abdominal distension, loose stools, poor appetite and fatigue. This is because even though you are getting the nutrients orally your body cannot process the nutrients. The spleen controls water metabolism. The spleen is responsible for transporting the excess fluid out to the meridians and out of the body. If you have spleen qi deficiency, it can lead to internal dampness such as edema, diarrhea, excess phlegm and a swollen tongue with teeth marks around the edges. How many of you are feeling some or all these signs and symptoms of spleen qi deficiency? For years were plagued with these symptoms but could not figure out the root cause in Western medicine or how to fix them. We tried everything under the sun in Western Medicine such as iron supplements, gas pills, changing our diet to a low fat diet but nothing worked. We felt ill, tired and had stomach issues all of the time. The Western Diet can cause many imbalances in our bodies, not only weaken our spleen but can cause issues with other organs. Today, we are discussing how it affects the spleen but stay tuned as we will also be discussing how our diet affects our liver, kidney and heart and how we can change our diet to restore balance. Whilst studying TCM at Hong Kong University, we were studying TCM tongue assessments. The professor walked around the classroom and asked to look at each of our tongues. She stopped, looked at me in horror and instructed me to make an appointment immediately at her TCM clinic. Diagnosis – severe Spleen qi deficiency and blood deficiency. It was at that very moment in time the healing had begun and it all started with a change in our diet. Raw foods are very cooling. Your body must heat up food to your body temperature for the Spleen to extract the Qi from the food. If you have spleen qi deficiency, eating raw food will take up your body’s energy that it needs to perform other functions. By the time the food is heated up, there is little food that is digested properly and you are more apt to have digestion problems. We know that in the summer you crave a good salad and a good ice cream but if you want to overcome your digestive health issues, we have some alternative delicious meals just for you to promote spleen healing. 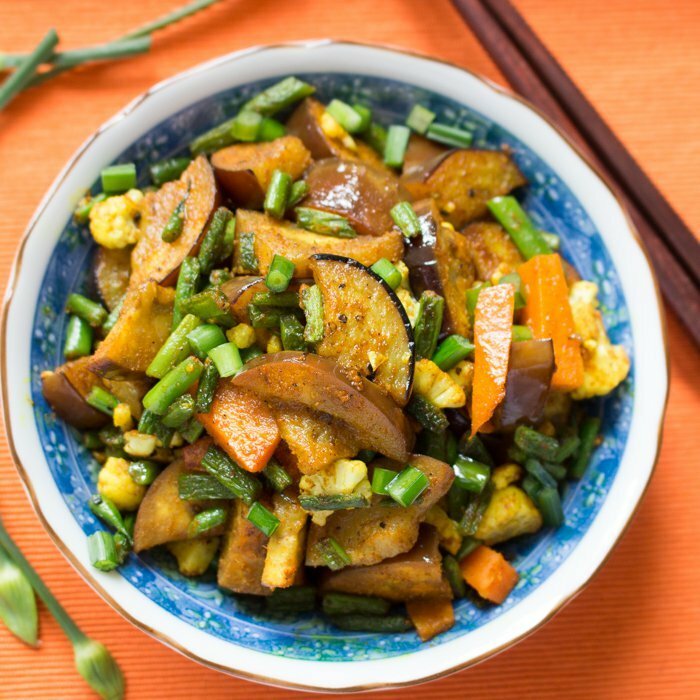 Feed Your Spleen with warmed and nourishing foods like soups, stews, stir fries with warming vegetables and spices. 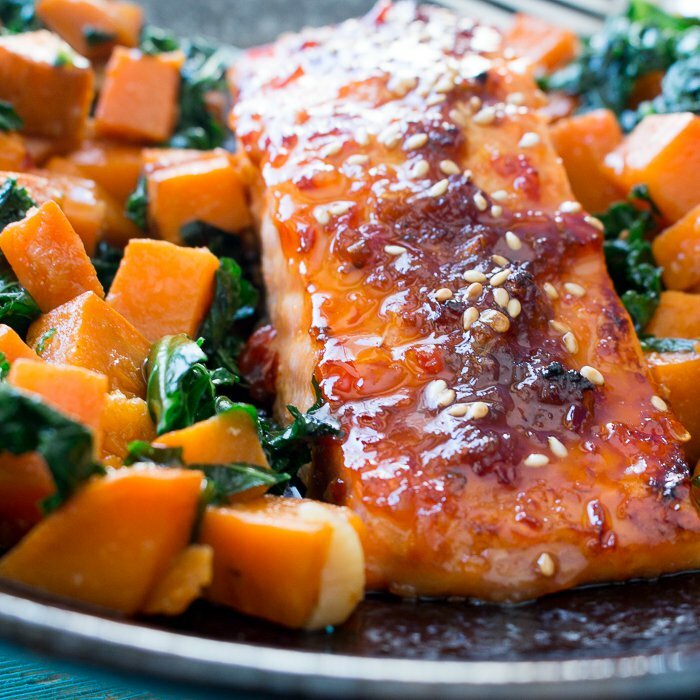 Crack out that Instant Pot/slow cooker as we have lots of recipes coming your way. Avoid iced cold drinks that come straight from the refrigerator or drinks with ice. A better option may be a little warmed ginger tea or hot water (or room temperature beverages) or bone broth. If we can break you of one bad habit, this would be the first step. This one simple easy change can really make a difference on your bodies ability to work more efficiently because it does not have to work so hard heating up the food/drink to extract the nutrients. Have you ever been to a Chinese restaurant and been served a glass of ice water to drink? If you have, you should just get up and leave. An authentic Chinese resturant would never ever do that. In a traditional Chinese restaurant if you asked for a glass of water, it might even be served to you steaming hot. Yep, thats right a cup of hot water. We used to always think they boiled all the water before consumption in Asia because of disease prevention. Well they do, but the main reason is to protect your spleen qi. We are not saying that all your beverages need to be consumed steamy hot but much better if at room temperature vs iced cold so it is not such a shock to your body. Dairy, gluten, sugar and greasy foods can cause increased dampness. The six exogenous factors are wind, cold, summer heat, damp, dryness and fire. These are the six climates in nature. These six types of climates will only cause problems if climatic changes are sudden or if the bodies’ resistance is low. Dampness is a predominant qi of late summer or whenever it is hot and rainy. Symptoms of dampness may display as soreness and pain in joints, turbid scanty urine and stools containing mucus. The spleen likes dryness and dislikes dampness. Dampness can impair the spleen can cause distention and fullness of the abdomen, poor appetite and loose stools. Like we have discussed before most people have a mixed condition so it may also be common to have IBS (irritable bowel syndrome) with alternating diarrhea and then constipation. 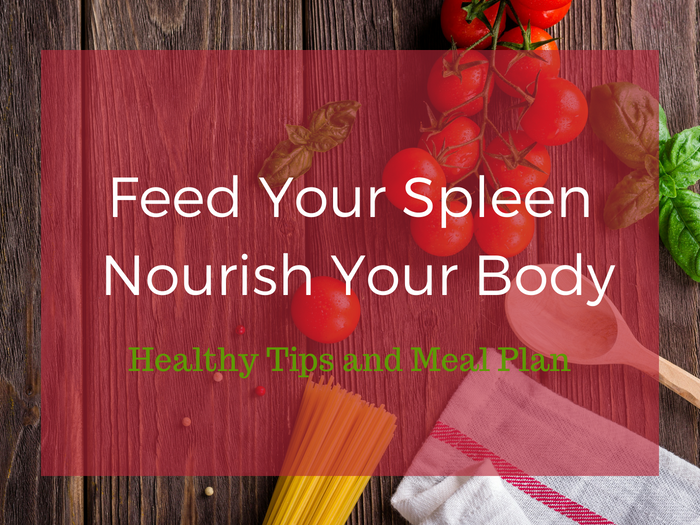 This Feed Your Spleen Meal plan is going to fill you up with warm, nourishing and easy to digest foods. Your spleen is going to love you. You will feel more energetic, less sluggish, less bloating, less brain fog, stronger and ready to tackle your day. 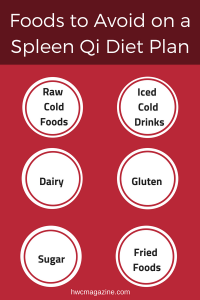 For all those who have spleen qi deficiency and to prevent spleen qi deficiency this meal plan will keep your motor running smoothly. Cooked and warming or neutral foods are best loved by the spleen. Fruits: Apricot, Cherry, Chinese Red Dates, black dates, Guava, longan, lychee, mandarin orange peel (dried), cooked peaches, raspberries. Spices: Caraway seed, basil, black pepper, brown sugar (in very small amounts – excess sugar can cause dampness), chili peppers, cinnamon, cloves, coriander, cumin, fennel seed, garlic, ginger, ginseng, turmeric, nutmeg, and rosemary. Proteins: chicken, lamb, ham, venison, shrimp, mussels, butter and shrimp. Neutral Foods are safe to consume for all body types as they are neither warm or cold. Examples of neutral foods are figs, goji berries, plums, carrots, turnips, mushrooms, string beans, kidney beans, rice, peas, pork and fish. Your food should always be eaten slowly and chewed well. It is best to eat like a king for breakfast, a prince for lunch and eat dinner like a pauper. In addition, eat at regular intervals and do not snack all day long or graze as your spleen does not like it. Soups, stews, curries, congee and broths are best tolerated by a weak spleen qi (spleen qi deficiency). Eggs (the egg whites are cooling) so you can have these only occasionally. Easy Spiced Golden Milk – creamy frothy dairy-free warming beverage with fresh turmeric, ginger, star anise, black peppercorns and coconut milk. TCM is a process that works but it a slower and it takes time and patience. You will not eat just one nourishing meal and go back to your naughty ways of eating raw cold foods and iced drinks and feel better. It’s a process. We want you to feel super! Start by making some small changes. 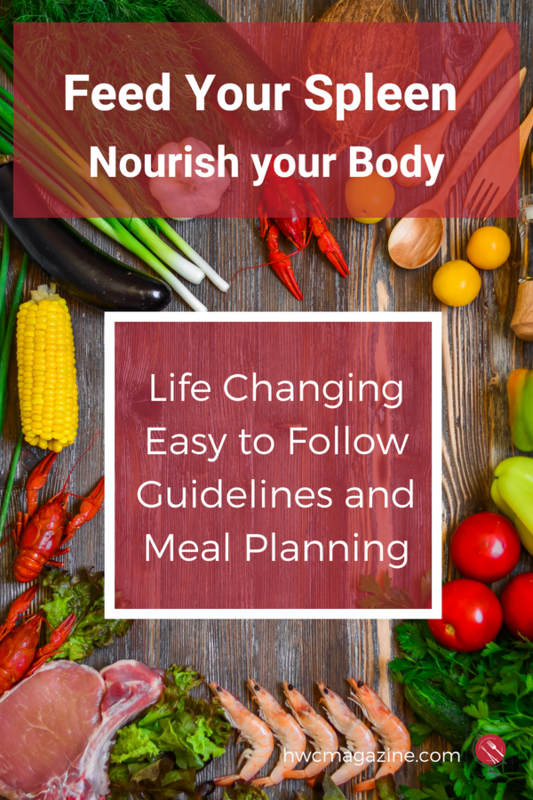 Include some of our tips and tricks for foods/drinks to avoid and start incorporating some nourishing foods into your meal plan for the week. Your spleen is going to love you! In TCM, it is widely believed that a great combination of herbs can work wonders. The best known traditional formula in TCM for benefitting the spleen is Gui Pi Tang. In fact, this formula (or a modification of it) is prominently featured in virtually every text that mentions the herbal treatment of disorders associated with spleen qi deficiency. In some books on formula applications, Bu Zhong Yi Qi Tang is also said to be effective in supporting the spleen. These two formulas have the following herbs in common: astragalus, ginseng (with codonopsis often used in modern China as a substitute), atractylodes, licorice. This basic combination of four herbs tonifies qi. You can get either formula at root + spring, a reputable online Chinese Medicine shop that has a selection of trusted herbal supplements They also specialize in herbal soups and teas. Please always consult with your primary care physician BEFORE starting any new herbal preparations.